Here’s a post to ponder while preparing for the upcoming RS/PH lesson, Chapter 6: “Sustaining Those Whom the Lord Sustains,” whether ye be a teacher at the front of the class or a teacher from the seats. I noticed an interesting trend while preparing for this lesson. Seventeen of the twenty-one quotes in the chapter predate George Albert Smith’s serving in the office of President of the Church. Following the manual’s selection, quotes given from before he was president tend to emphasize the importance of sustaining the President of the Church whereas quotes after his sustaining tend to focus on his own weaknesses and desire to serve. “I thank you for the confidence that has been manifested…in hoping that I may succeed, and promising as some of you have, that you will help me to succeed, because I am only a man, one of the humblest among you…I will need the help of every man and every woman and every child, not for my blessing, but for your blessing, and for the blessing of the children of men wherever they may be. That is not my responsibility, that is our responsibility” (TPC:GAS, 57, italics in the manual, not noted whether in original). “What happened when [Joseph Smith] died? … [The Saints] didn’t hold a conclave, choose a chairman and pick a new leader. The leader had already been chosen by the Lord. He was the senior member of the Quorum of the Twelve, Brigham Young. … The Church as a body in all its sessions sustained him as President. Perfect order prevailed. …I have traced some of these things in order that there may be no mistake. Joseph Smith did not choose himself to be President of the Church. Neither did any who followed him. … The appointment comes from our Heavenly Father through His inspiration, and men receive all the power that comes with an appointment” (TPC:GAS, 59, ellipses and brackets are from the manual). The fourth quote (from Smith’s actual presiding time period) refers to following the “leadership of the Lord, and those whom the Lord sustains,” but doesn’t refer directly to the office of President (60). Ten of the seventeen remaining quotes can be understood to refer to the President of the Church (a few refer to Old Testament prophets, who conceptually bring to mind the president of the Church more than the other leadership, I suspect). The other quotes refer to “the men who preside over his Church,” “holy men,” (59), “various offices” (60), “leaders” (61), “those whom the Lord has called to lead us” (63), “these men whom God has raised up to preside” (64) and a few other similar descriptors. It’s interesting to note that almost all of Smith’s quotes about sustaining the President of the Church are excerpts from talks which preceded his own administering in that office. In part 2 I suggest a few discussion questions teachers might ask and add a few references which help flesh-out the overall content. 1. Other quotes in the lesson speak of prophets as men with “human frailties, they will make mistakes,” (63) and he also refers to the heavy “burdens” carried by the President (64). These selections provide a good opportunity to discuss some of the emotional and physical difficulties George Albert Smith faced during his life, if the Spirit so directs. See J. Stapley, “Mental Illness and George Albert Smith,” bycommonconsent.com, 4 January 2012. 2. 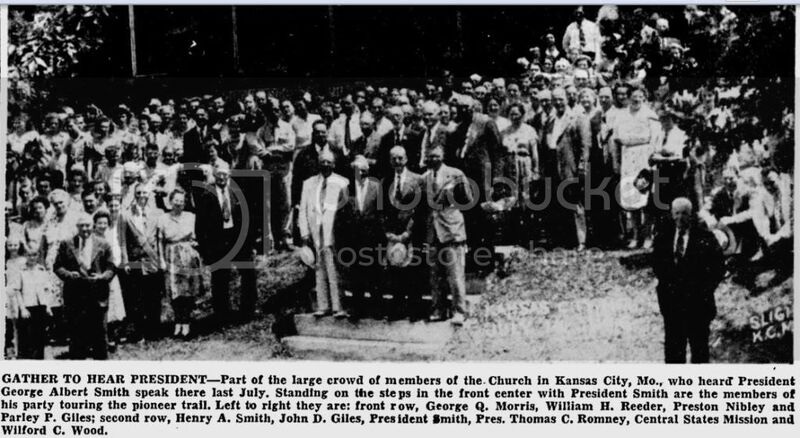 See “The Church with Divine Authority,” Deseret News, Sept. 28, 1946, Church section, 6, 9. On the succession question, see D. Michael Quinn, “The Mormon Succession Crisis of 1844,” BYU Studies 16 (Winter 1976): 187-233. Even this article is a bit dated. It is, needless to say, a fairly controversial part of our history. A decent overview of the official story of the succession is Brent L. Top and Lawrence R. Flake, “The Kingdom of God Will Roll On”: Succession in the Presidency,” Ensign, August 1996. 3. No single lesson appears to focus specifically on women. One chapter, “Bringing Up Children in Light and Truth,” discusses children specifically. « The Presiding Bishopric. Your April Conference Prep. Part 2: More on Early Mormon Bishops. Our RS switched lessons because teachers had prior engagements, so we had this lesson last week. I thought about commenting that we sustain auxiliary leaders as well, but the bent of the discussion was focused on the prophet, so I didn’t. It makes sense, out of a sense of humility, that one would talk with great strength about sustaining God’s living prophet when one is an apostle and then speak more demurely when one is the prophet. Apostles and prophets of necessity must testify about the divine call of prophets differently. Thanks for pointing out the subtle problems with the meaning of the text caused by less-attentive editors. I didn’t look up all the references – just sat there puzzling over them, looking around the room and seeing women who would not be edified by a discussion about how comparatively messy the succession was after Joseph died. Messy is okay with me, but not for everyone. Still, I would have preferred a less muzzled feel to the edited quotes. Ah well. Wish you had posted this a week earlier Blair. We had the lesson last week as well. Now I cannot torment my fellow HP’s. 1. In glancing through the dates of most of GAS’s statements included in this lesson, I noted that many came from the period when Church leaders were combatting the early rise of fundamentalist Mormons. 2. Perhaps you’ll cover this in part II, but my favorite anecdote of GAS and sustaining Church leaders was when he repudiated the erroneous “when the Brethren speak, the thinking has been done” belief. See here. Our last couple lessons have been the HPG sitting around in a circle, focusing on one or two particular themes or paragraphs from the manual, using them as our ‘text’, and then having a group discussion about its relevance and practicality in our lives. More of a moderated discussion than a ‘lesson’. It’s been fantastic, and far better than the lecture-style lessons with rote Q-and-As that can often tend to happen by default. Also, look forward to the succession project. Regarding the fundamentalist Mormon thing, also keep in mind where GAS was speaking to members. He also refers to a group of members in Mexico who supposedly decided to make their own faction of the church by calling their own leaders, but a few years later they decided the move was wrong and rejoined the main body. Does Jared T. have any info on that anecdote? I taught this lesson last Sunday. It was a fun one. There is a quote in the manual about criticism of leaders, and I referenced the following quote from Elder Ballard’s April 2011 conference talk. If we have charity, we aren’t going to be criticizing others, especially our local leaders. This doesn’t mean we can’t offer helpful suggestions, but we’ll do it with a spirit of love. We too had this lesson last week. When the succession paragraph was read, I made a gentle comment to the effect that that which seems clear and obvious to us today about how succession is supposed to work at the time was not clear or obvious at all. No one had a problem with that. I too am glad to learn that GAS’s actual text was not as hamhanded as what is in the manual. PS- Made a correction. The first header said “pre-presidency quotes,” but it was supposed to be quotes while serving as president. We had the sustaining lesson last week as well. Wish I’d had this going into it. Seems like everyone already did this lesson. What’supwiththat? I’m glad you broke down the timing of the quotes, and clarified some omissions or errors in the manual regarding the wording, and consequently the entire meaning of said quotes. I taught that lesson this last week, and I’ll admit I had a hard time using the manual. Luckily I found this https://bycommonconsent.com/2009/06/25/when-our-leaders-speak-the-thinking-has-been-done/ blog post which I presented as a case study. I passed out the quote from the Improvement Era and asked if anyone had any concerns or comments about it. We then read the letter from Raymond Cope to George Albert Smith and his subsequent reply. I think it worked pretty well — the point I was hoping to make is that there are all kinds of quotes that come from valid sources that don’t always express the entire picture. I think one of the challenges of Mormonism is wrestling with the tension between personal revelation and hierarchical authority. In our ward/stake we have the GAS lessons on the 2nd and 3rd Sundays, which means odd number lessons on the 2nd Sunday and even number lesson on the 3rd Sundays. I have seen a couple of posts on blogs about GAS lessons that are too late for my stake’s schedule. It seems that we are not all on the same schedule. Thank you for some excellent enrichment. “hamhandedness” and “lecture-style lessons with rote Q-and-As” often make it dfficult for me to attend these lessons. I have a question that I could probably research the answer to but someone here may have the answer off the top of his/her head. Our current practice is that the longest serving member of the Quorum of Twelve is the president of that Quorum. Has this always been the case, or was there a time that they chose/sustained their leaders by some other method? Was BY the longest serving member? It seems like AP quorums also have this practice, but local MP does not. Any clarification for this non-priesthood member will be appreciated. charlene, IIRC originally seniority in the Twelve was determined by age (since the original Twelve were all appointed at the same time, a seniority system based on length of service in the Quorum wouldn’t have worked). As people started to come and go, at some point they changed it to a length of service in the Quorum seniority system. There was one issue not resolved until 1900 I think. When I was a local leader I wanted to hear the other side. If I follow the Golden Rule in this matter, then I would be lambasting my leaders. As EQP a few years ago I asked one of my rabble rousting friends to sit on the back row and tell me what I was doing wrong. Put it on paper so I can read it and remember. I made it an official calling- Underground EQP. He was the most helpful member of the quorum and he didn’t pull many punches. I had a great need to be corrected and he filled my need. It is anything but kind to realize our leaders are making mistakes and then just sit there and watch the proverbial lower intestinal contents hit the rotating mechanical device. It is not supportative to pretend all is well, quite the opposite. What is lacking in the LDS church is a sensitive and charitable mechanism of informing leaders of disagreements. We have weak or few viable mechanisms to settle conflicts beyond “do as you are told.” The current method relies too much on the asumption that there are no conflicts and if there are any it is certainly not the leader’s problem. Unity is far from loving and only superficial when conflicts are buried or ignored. Passive aggressiveness reins and we all eat flaky Mormon casserole for Sunday dinner every week. Second, and relating to that, if everyone felt free to disagree and voice their opinion everytime a thought pops into their head how to do better, we’d have 200 people coming up to the Bishop after sacrament meeting. Whatever happened to the rough stone rolling? We don’t need to get the stone polished up to move it along, but little by little as it rolls corners here and there get knocked off. I know that I certainly don’t want it to be my role to be the corner chipper who tries to polish the stone after my own image. Many thanks for your quick answers. I’ll read the linked pieces and inform my impressions of how habit/policy/divine guidance relate and influence each other on this issue. I think 20 and 21 both have viable points. I think it all falls under a time and a place for everything. I don’t believe that as a people we should simply sit down and shut up, but I also believe we need to know when to pick our battles as well. I don’t consider any religion viable that suppresses independent thought in its adherents. Not for me anyway. Ha, Meldrum, I like the “Underground EQP” idea. Also, as a few others mentioned, there is a balance that must be struck between criticism and supporting. I am of the mind that criticism when offered in particular ways for particular reasons on particular issues can be an important element of sustaining. I’ll try to do a post on this in the future. I found this interesting since deciding on how succession should be accomplished was one of the main reasons we originally split paths. We had the sustaining church leaders lesson in my ward last week. Toward the end of the class I kind of hijacked the lesson by bringing up the interaction between Henry Eyring Sr. and Jospeh Fielding Smith in the 1950’s . Joseph Fielding published a book “Man his origin and destiny” which took a very anti-evolution perspective and argued for a young age of the earth. Eyring in response to this spoke againt the book and wrote a letter to Adam S.Bennion who was also in the quorum of the 12 arguing that the sceintific evidence did not suppport Joseph Fieldings view on the age of the earth and evolution in general. Not surpisingly Joseph Fielding found out about the letter and responded to Brother Eyring and he in turn replied.Eyring had a personal meeting with Joseph Fielding. Needless to say neither one of their minds chaged. I expressed my view that Brother Eyring was right to critiicize Joseph Fielding as he had more scientific expertise than Joseph Fielding . I also pointed out that all the scientific devlopements since the 1950’s have shown that Brother Eyring was right and Joseph Fielding was wrong about the age of the earth. I also pointed out that while Brother Eyring disagrred with Joseph Fielding on scientific issues he contined to sustain and uphold him in his role as an apostole. I expressed my belief that Brother Eying preformed a great service to the church by giving an example of how one could believe in evolution and that the earth was billions of years old and still be a faithful member of the church. I did also note that one reason Brother Eying could get away with criticizing Joseph Fielding was that Adma S. Bennion was a cousin of his wife and Spencer W. Kimball was his brother in law. Wow, john willis! Bravery and tact. SteveP would love that experience. And suddenly I know how I’ll begin my lesson when I teach it next month. I know the Eyring Sr. story well, but probably wouldn’t have thought to use it. Thanks, john willis. Thnks for the kind words. For others who are not so familar with the Henry Eyring/JosephFielding Smith story I would refer you to the recent biography of Hnery Eyring Sr. by his grandson Henry Eyring (the son of Henry Eying of the First Presidency.) The book is Mormon Scientist published by Deseret Book. I must confess that Henry Eyring Sr. was an intellectual hero of mine. I also have a persoanl connection in that my grandfather Martin Mortensen was one of Brother Yring’s teachers at the Gila Academy in Thatcher , Arizona. The academy is no Eastern Arizona Junior College. .
#30 Thanks for the book recommend, I will definitely look into it. This is a subject I am very interested in. you can get copies of the Eyring /Smith correspondence in the book “The search for Harmony ” CHAPTER 8 by Stephen Heath publioshed by Signature Books. You can access the book at the Signature books website. I also taught and used the “thinking has been done” letters posted here at BCC a while ago. Thanks for this information. I’m enjoying GA Smith. After current FP/12 approve quotes to be in Teachings of Presidents of the Church, what’s the difference? A couple of weeks ago I noticed a quote left on an institute blackboard by one of our current apostles. It stated that in his experience he gained improved spiritual strength when he stopped asking questions of the answers that were given by his leaders. This statement surprised me so I added to it the observation that in the Psalm of Nephi, Nephi grows spiritually when he lets go of emphatic answers and of trying to count his many blessings. It is his beginning to ask questions that leads him to a healthier spiritual state. R. Gary, that is a fascinating question. I’m assuming from the phrasing of your question, that you don’t think that there is a difference. What is it about being published in a manual that renders the context of a precise teaching of no consequence? The name of the manual? Its publisher? Its stated purpose? Any manual, including one that was written by every member of the First Presidency and Quorum of the Twelve together. The FP/Q12 approved the manual, and I suppose that includes the footnotes with dates in them. In this instance I’d imagine they didn’t check up on the original sources or else they might have noticed that a particular quote was taken out of context in a confusing way. Regardless, the citations with dates are there in the manual. Why not take them into consideration since they’re in the manual? BHodges: Apparently, you didn’t get the memo. At one time, the Church did make a careful distinction between the teachings of a Church President and the teachings of the same man before he became Church President. Apparently, you didn’t get the memo about that policy change. Accordingly, in the 1978 edition of Gospel Principles Chapter 39 on Chastity, Spencer W. Kimball was referred to as “Elder Kimball” even though he had been, since 1974, Church President. The same policy change was apparently in place for the 2007 MP/RS manual where more than 80 quotations from his 1969 book are published by the Church as Teachings of Presidents of the Church: Spencer W. Kimball. P.S. There is an Introduction in each of the ten Teachings of Presidents manuals, with instructions for MP/RS teachers. I can’t find where it says to teach from the footnotes. LOL @ arguing the style guide is inspired of God. You crack me up, R. Gary. Referring to presidents of the church in the president manuals as “President” is almost certainly for simplicity’s sake. I’ll say “almost” in order to avoid any sort of R. Gary dogmatism. So as to avoid annoyingly switching between elder and president all over the place in the manual. Remember how Elder Ballard said we aren’t “Mormons,” then there was mormon.org? Maybe things aren’t as clear-cut as you desperately want them to be, my friendly friend. BHodges, only a crazy apostate would teach material straight from the manuals, specifically, the footnotes portion of the FP/Q12-approved manuals. For shame. Oh brother, R. Gary. As a historian, I take special interest in the dates/context of particular quotes. I admit I was constantly flipping to the footnotes last Sunday during this lesson precisely because I wanted to know if he was speaking before he became Church president in 1945. That’s good context. Blair, thanks for this. I had some conflicting thoughts/feelings during this lesson, but I limited my comments to those I was quite settled about. And no joke, I also brought up the same story john willis mentioned from “Reflections of a Scientist” about Henry Eyring Sr. And Joseph Fielding Smith. My fellow quorum really appreciated hearing about that. Anyway, I’m really looking forward to part two! BHodges: Nice deflection. Do you really think anyone besides yourself reads “inspired” into the Style Guide quotations? The practice of the Church constitutes the official interpretation of the Church’s policy. The ’70s manuals were consistent with the Style Guide as seen in the 1978 Gospel Principles manual. The new manuals are consistent with a changed policy as seen in the 2009 Gospel Principles manual and in the Teachings of Presidents series. I’m sure you can speculate as to the reasons for the policy change as well as anyone else can speculate. But the policy changed. Regarding mormon.org, do you mean Russell M. Nelson’s talk, “Thus Shall My Church Be Called,” (Ensign, May 1990)? It was President Gordon B. Hinckley who changed that policy in, “Mormon Should Mean ‘More Good’” (Ensign, Nov. 1990). Mormon.org came later. And I think Elder Nelson had no problem following the latest counsel from President Hinckley in preference to his own former counsel that was updated by Hinckley. As a web developer who has worked on lds.org projects that have been presumably approved by the First Presidency in some fashion, I’d like to ask R. Gary if my code is infallible. R. Gary: I saw some “no parking” and “loading zone” signs in the underground Church Office Building parking garage recently. As Church publications and official Church policy, those signs were personally approved by an apostle or member of the First Presidency, right? My question is, is the yellow striping, which conveys meaning but without the use of actual text, likewise inspired? A deacon in my ward happens to be a future president of the church. I’m keeping careful record of everything he says so his inspired words can be properly cited. You’ll be pleased to know that he has rescinded that annoying “one at a time” clause in Section 132:7. Joseph famously said that a prophet was only a prophet when he is speaking as such. Now we know that a prophet is a prophet even before he becomes a prophet. RGary, in order to interpret what happened there with that apparent conflict that BHodges brought up, you: (a) looked at the relevant dates of the statements (May vs November of 1990), and (b) looked at the sources of the two statements, explicitly noting that one is President and one is not. Ardis: It is very likely, if the yellow lines happen to be painted on brick paving, that they are inspired. Left Field: Was your deacon sustained by the Church in October Conference as one of the “prophets, seers, and revelators”? Cynthia: Suppose Elder Nelson’s May 1990 talk is reprinted by the Church after he becomes Church President (it could happen)? I think your not being very fair to Rgary here… he raised a valid point. Just as Joseph took a verse of scripture and breathed new life into it its not out of question that modern authorities can take previous statement and authorize them with and enlarged meaning. We could otherwise very easily imagine Lemuel telling Nephi, “Well that’s not what Isaiah meant or said… you’re taking it out of context”. I’d tend to err on the side that says if the FP publishes a book called teaching of the Presidents of the Church they are authorizing the teachings to be used in the manner they are presented in the book regardless of a possible limited original scope. That being said obviously mistakes occur…. I don’t see where the beef is on this issue though. All that being said personal revelation is the most important consideration when it comes to applying these and other gospel subjects in our lives. So it Rgary or anyone else says something contrary to what the holy ghost has revealed to pertain specifically to you who cares? #55 – Let me get the popcorn. What is fascinating to me is that R. Gary consistently argues from authority using sources that no Mormon considers authoritative. I’m not discussing the quotes per se, I mean the committees and bureaucratic handbooks that most members are unaware of and don’t care about. He seems to endow every memo from the top floors of the Church Office Building with a kind of inerrancy that the Brethren themselves deny. While I don’t find the lesson objectionable (I feel like we would be better of if we more generally followed the Brethren’s counsel), I find R. Gary’s defense of it bizarre. Defend it on its merits, dude, don’t come up with trivial technicalities to justify the choices. Defend it on its merits, dude, don’t come up with trivial technicalities to justify the choices. John, if you read the NDBF blog, I think you’ll find that the use of “trivial technicalities” is central to the m.o. huh. I’ll leave the style guide alone. My first thought when reading the OP (we haven’t had the lesson yet-we are losers) was of the Hannah story in the Old Testament. That is almost always the story I use when talking about dealing with an imperfect leader. Where R. Gary is missing the entire point here is that he apparently believes I’m arguing that statements George Albert Smith made prior to becoming president of the Church are somehow less “true,” or important, or binding than those he said after becoming president of the Church. Of course, I’m arguing no such thing. R. Gary is entirely missing the point. Thank you for this post. I have not had a chance to read all of the comments here yet, but I did watch the Backyard Professor video referenced in #2. I really liked what he had to say in quoting Joseph Smith and Brigham Young about using our brains. I think Brigham Young was right on when he said God wanted us to be dependent on no one except God. We had this lesson last Sunday and one of the things mentioned in class was that we must, through prayer, confirm for ourselves the things our leaders say and not follow blindly. So it seems my ward, at least, believes that we need to think for ourselves. Of course, I live in the best ward in the church. That’s right, Sharee. That’s why I said I had some conflicting thoughts during the lesson, because I’m uncomfortable with the interpretation of “sustain” as the non-thinking “follow the leader” and “do not question” mentality. I’m completely comfortable with the notion of sustaining being supportive and charitable to those who have been called, and always with the Golden Rule. Even if we disagree with some things, A) not all disagreements must be shared (In fact I’ve had to learn that it’s usually healthier for my spirit to live a little with a little dogmatism rather than get so worked up about some things) and B) if something must be communicated it’s usually more charitable to do so privately rather than call someone out publicly. I recognize that we’re all on the same team and we’re in this together, so I certainly don’t believe that sharing suggestions necessarily equates to criticism or rebellion. Since the lesson itself explicitly calls attention to this division I’m confused as to why you, the biggest manual literalist I’ve ever encountered, would take issue with this. I’ve tried to imagine why this bothered you so much. I could be wrong, but perhaps you believe I’m arguing that statements George Albert Smith made prior to becoming president of the Church are somehow less “true,” or less important, or less binding than those he said after becoming president of the Church. Of course, I’m arguing no such thing. Nor is the manual, I presume. Y’all sound like a bunch of legalistic donkeys. Like I am about as far out in the wilderness as anyone on the blog and I feel for R. Gary. Far be it for me (with my long history of the opposite) to call for a more measured response that doesn’t drive others off to their own playground and then smirk at them. Perhaps we can all learn something from both sides of this disagreement. R gary come back, or at least don’t let this get you down, even if some of us think you are off base. I may be speaking out of school here, but to me, it matters when GAS said certain things only for accuracy’s sake but it does matter to me. I am rusty on my MormEtiquette but I take everything that anyone says with the same weight until I pray about it. I had always been taught, ^and the Backyard Professor video up there confirmed that we are supposed to think and pray and receive witness for ourselves. That being said, only good can come from knowing when a quote comes from not to determine its weight or authenticity, but for (again) accuracy. I taught this lesson this last Sunday and I took some significant liberties with what was written in the manual, adapting the topic to the crises of faith in Church leadership that seem to be everywhere right now. (Sustaining prophets while acknowledging significant prophetic fallibility, balancing obedience against the imperative to seek and act on personal revelation, etc.) My approach seemed to somewhat distress at least a couple sisters in the class, but others including our wonderful RS pres were positive about it (or at least they did a good job pretending to be! ), so I hope I will not be deemed in the final measure to have failed to sustain the spirit of the manual. I focused on George Albert Smith’s humility and his emphasis, which you noted, on the church and its projects being *our* responsibility rather than just *his* responsibility; that, like us, prophets are allowed to make significant mistakes in carrying out their callings; and that we should grant prophetic mistakes the same compassion we grant our own. Also that our default setting–especially in the absence of a prompting to the contrary–should be obedience, lest we become self-deluding. Thank you for looking up the original quote on the JS succession thing. I love Geo Albert Smith and consider him a particularly thoughtful and humble Church president and so was dismayed when I read that segment to think that he had done actual research on the JS succession and concluded that there had not been any real issues with prophetic succession in Church history. I didn’t have time to do much of anything with the “how prophets are chosen” section of the lesson, but even if I had had more time I wouldn’t have known quite how to handle it….because I didn’t take the time to look up the full quote, as you did. Don’t worry, they might not ask you to teach any more and you will have time for something else. Seriously, we better watch what they are saying either way. I notice that my response to the discussion a couple of days ago didn’t make it. (#20 and #21 and following). Sorry for the apparent ignorance. But do you really think (Chris #21 especially) we are anywhere near balanced in the church at this time between the Third Reich and a Free For All as described? I personally don’t see anyone at church even making feeble attempts at offering constructive suggestions (except a few blogs on the internet). It pains me when the critics call us “sheeple” but then it rings true to me when I look around at church. And it doesn’t seem to me the rough stone is rolling very much any more; it appears to be sinking into a quagmire of apathy and ersatz. Be the change. Be a humble change. Then you haven’t served in my wards and stakes – and I’m not talking only about myself. It’s easy to blame our leaders, but I’ve offered “constructive suggestions” and even expressed strong disagreement to Bishops and Stake Presidents and others with whom I’ve served – and not once have I been reprimanded for it. In fact, after I’ve been released, I’ve received comments from many of them thanking me specifically for the different perspective I brought to the discussions. Most leaders, I believe, want to hear different perspectives – but they want to hear them in a non-confrontational, loving, humble delivery. Most of it has been attitude, tact, phrasing and choice of where and how to express myself in that way. I almost never raise my voice; I don’t insult or “challenge” in any way. (I’m worse in that regard online than I am in person.) I try hard to phrase my words in a way that won’t be offensive automatically. I smile most of the time, so when I don’t smile it means something visually. I crack jokes often, so I’m not seen as a constantly complaining downer. I usually offer the strongest objections privately – one-to-one (or even in e-mail) – if I want to stress something more strongly than I did in the group setting. Iow, I try hard not to be an a**h***. I know not all leaders react as I described above, but I take responsibility directly to make sure nobody sees me as a threat – and it helps tremendously. Like Blair said, be the change you want to see. Aye, the old “wise as a serpent, harmless as a dove, funny as a late-night comedian” routine, Ray? A good one. The title of the lesson is interesting. “Sustaining those whom the Lord sustains”. The Lord does not “obey” the leaders he sustains. But he does support them. He helps them accomplish their purpose. “Sustaining” has almost nothing to do with obeying and a lot to do with doing all we can to assist in accomplishing the Lord’s purposes. Lessons which equate sustaining with obeying are missing the point. BHodges: The comment you left over at ndbf yesterday has now been published here. Some of my thoughts are included also. Thanks R. Gary. I reckon the ribbing responses you received aren’t merely in reference to your one (seemingly loaded) question here. They are responses to what people generally understand to be your hobby horse regarding lesson manuals, as well as evolution. When you come here to BCC and try to get combative then go back to your blog and write weird posts about Margaret and others you’re not going to win a very sympathetic audience here. You’ve clearly blown this entire exchange entirely out of necessary proportion and you’re the only one in 70+ comments who showed any concern about what this post was intended to do. Perhaps we all have beams in our eyes.